Imagine yourself in the heart of the city, surrounded by the sounds of water lapping, ravens calling and the white noise of the morning’s freshly fallen snow. The aroma of freshly cut flowers fills your heart as your eyes wander over the soft edges of 150 year old rose petals. Your eyes pause to drink in the delicate brush strokes of muted tones of yellows, greens and blues. You feel your breathing slow, your gaze lingers. This is a place to breathe. This is a place to feel time stand still. 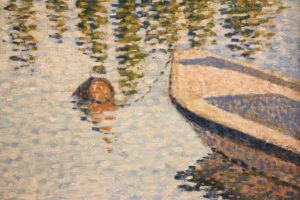 With an extensive selection of masterpieces from the collection of the Musée d’Orsay in Paris, The ‘Colours of Impressionism’ at the Art Gallery of South Australia provides this place. Showing until July 29th, this is a place for art enthusiasts and occasional ‘ponderers’ to lose themselves and become swept away. To look, pause and look again. Now… imagine this place with children. Sound fanciful, magical, unreal? Surely this place is too ‘grown up’, too ‘sophisticated’, too… ‘tricky’ to take your child? When, exactly IS it the ‘right time’ to take a child to see public art anyway and how do you make this a ‘meaningful’ experience for you and your child? The answer is a firm yes. Yes, encourage looking. Yes, encourage talking. Yes, dare to ponder, wonder and dream by looking at Art. 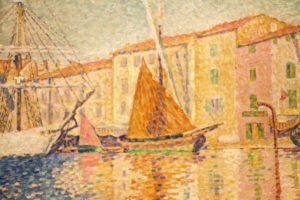 The impressionist collection has been organised to focus on various stages of artists and their responses to the development of the ‘modern era’ and is a fabulous place to engage your child with Art. Each ‘gallery’ (room) shows progressions of colour, technique and subject matter with written commentary to be viewed at your leisure, both on the walls and in a booklet handed to you at entry. Differences from room to room are noticeable enough that even very young children will be able to appreciate them…. If needed, start with a few guiding questions such as: “what do you see?”… “what tells you that?” Walk. Sit. Revisit the same painting. You will be amazed at what children may notice that you haven’t. Subjects: Encourage your child to look closely at the paintings by finding certain objects, animals and people. Counting birds, animals or boats for very young children can be fun and will encourage them to observe and look longer. Embrace some of the history…With older children you might like to discuss how the people are dressed, what they are doing or whether they can imagine themselves in the picture. If the painting could talk what would it say? 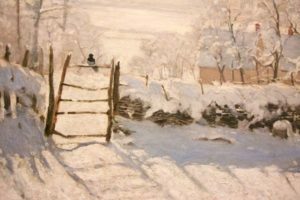 Which painting would they most like to ‘step into’ and why? Colour: The various use of black, blues, greens and violets, are depicted quite differently depending on which Gallery (room) you are in. See if your child can notice the changes as you walk around. Ask your child to find certain colours within paintings and to look closely. What colours can they see? What about the shadows? How do these vary from picture to picture? What feeling/mood do they think the artist was trying to show/portray? Techniques: located central to the room are examples of palettes and brushes used by Impressionist artists Degar and Renoir. Begin a conversation with your child by asking what they think they might be for and/or made of? What do they think artists use today? Move around the art. Step closer and further away. What do they notice about the brush strokes and texture? 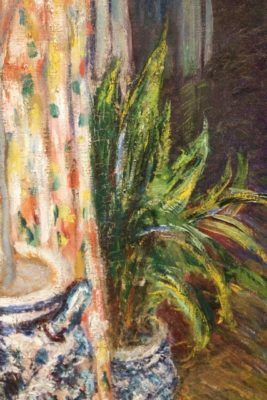 Why are some paintings rough and some smooth? Which do they prefer and why? Imagine a soundtrack to the paintings, what would it be? Most importantly, be guided by your child. There is no right or wrong way to interpret art. Take your time, sit, move around the art, draw, chat…be present…’smell’ the roses if you like. Continue to ask your child open-ended questions and encourage ‘long looking’. Share a bite to eat, draw a picture or engage in one of the galleries art activities…Above all, enjoy. 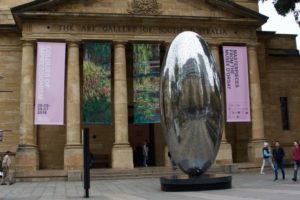 It has travelled exclusively to Adelaide and will return to Paris at the end of July so an event not to miss.